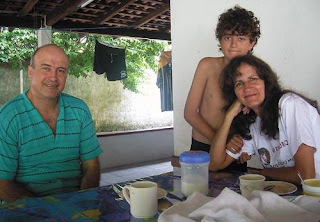 Today’s Columbus Local News features BMH author and GBIM missionary Bruce Triplehorn (pictured here with his wife, Lisa, and their son, Jonathon, at their home in Brazil) and the publication of his recent book, Worship, the Golden Thread, by BMH Books. This is an excerpt–to read the entire article, click here. Bruce Triplehorn points to a picture of himself on his laptop computer. He is standing waist-deep in the murky waters of a jungle river, surrounded by eight or nine smiling Brazilian men. He explains the shot is of a baptism, but he is quick to point out, although a few of the men studied the Bible directly with him, most of the others have come to be in the river because they studied with his pupils. That word-of-mouth spreading of faith is “what real Christianity is — teaching one on one,” Triplehorn said. For Triplehorn, 51, who grew up in Upper Arlington and graduated from Ohio State University, it is the type of moment he has devoted his life to. He said he fell in love with Latin American culture while he was studying leaf-eating insects for his post-graduate work, but even though he always had a strong Christian faith, he wasn’t always sure how he wanted to exercise it. It was when he and his wife, Lisa, 49 — also a graduate of both Upper Arlington High School and Ohio State — saw Christian musician and speaker Keith Green in Columbus that they felt challenged to do something more than simply observe their religion. He later left a job as a professor of biology at Liberty University in Virginia — he studied at the seminary while at the university — to become a full-time Christian missionary in Brazil nearly 20 years ago. Together the two have raised four children and spent some two decades sharing their beliefs as members of Grace Brethren International Missions. “We just really saw that, even though (Bruce Triplehorn) had his science, we really wanted to invest our lives into things that were going to be eternal and lasting,” Lisa Triplehorn said. Bruce Triplehorn spent the last four years writing a book, published in November, about his experiences and his outlook on both life and his religion. Worship: The Golden Thread is 500 pages of scriptural teachings mixed with examples from his experiences living in a foreign country and his married life. He said the central theme of his book is simple: the interweaving of an individual’s faith with his or her everyday life.